As soon as you awake, make the sign of the cross. I intend also to gain all the Indulgences that I can in favor of the souls in Purgatory. O my God, for the love of Jesus Christ, preserve me from all sin. My Jesus, by Thy merits, grant that I may live always united to Thee. Mary, my Mother, bless me, and protect me under thy mantle. 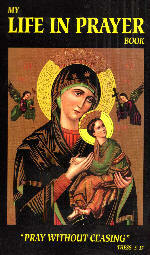 My Holy Guardian Angel, and all my Holy Patrons, intercede for me. Amen.